Once again my country of birth, Hungary, made it to the cover of both the North American and Asian editions of The New York Times. And not for a good reason. The article laments that, 25 years after the collapse of the Berlin Wall, Hungary, which was back then at the forefront of the transition from communism to democracy, is now turning away form Western values. That the prime minister, the same Mr. Orban who once played a leading role in that transition, now rejects Western values and preaches “illiberal democracy”, citing countries like Russia or Turkey as worthy examples. Such criticisms are routinely rejected by supporters of Mr. Orban as “misguided”, a product of a Western media that “only listens to liberal critics”. And this plays well with an audience that is accustomed to the notion of national victimhood. Hungary is seen by many Hungarians as a victim throughout history. The country was a victim of the Paris-Versailles peace treaties. A victim of Germany and national socialism. A victim of communism. And now, a victim of Brussels’ new “colonialism”. Maybe one day the focus in Hungary will shift from victimhood to responsibility. For being accountable for one’s actions. 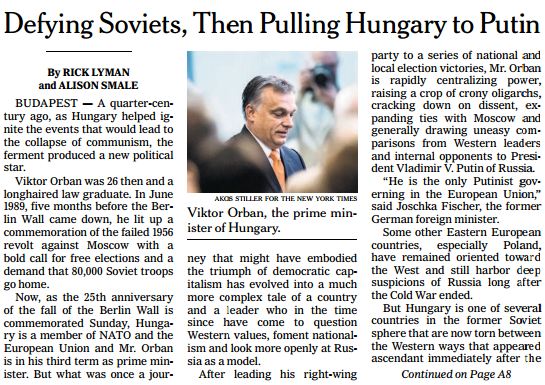 Maybe that day, Hungary will no longer be easy pray to populist demagogues like Mr. Orban.